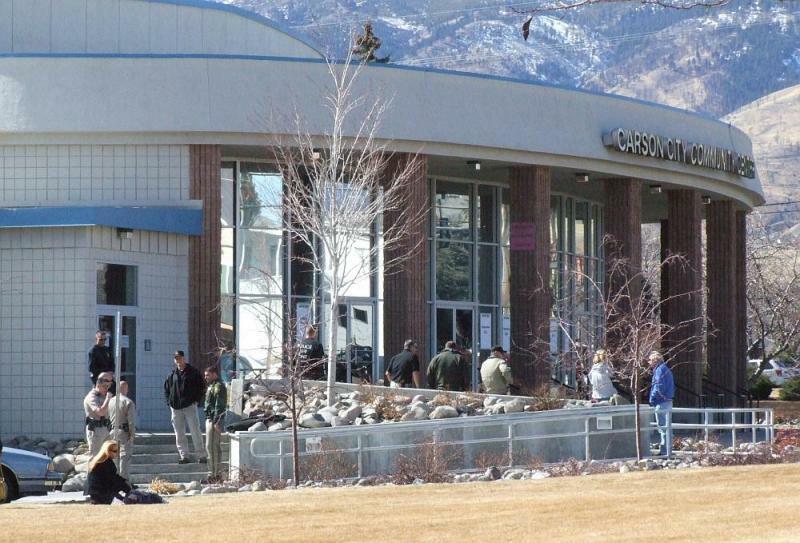 I went down and cruised by the Community Center today at noon, while the candidate’s forum was going on. I was expecting the scene to be a little more hectic that it actually turned out to be. 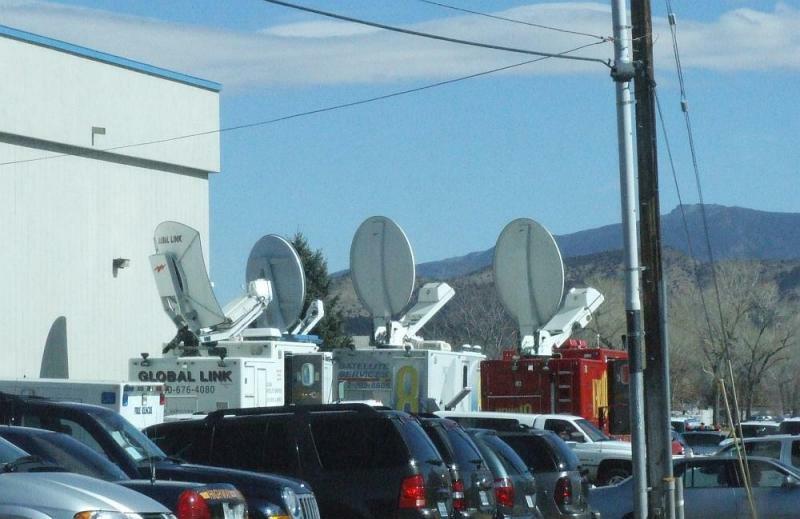 The parking lot was full, which can be common anytime there’s an event going on there. But there was no traffic backed up, no throngs of people standing around outside. It really wasn’t much different from any other day. and the police that were out in force, surrounding the building on all sides. They even had a bomb squad truck prominently parked where there was no way to miss it, just in case any of those protesters got any wacky ideas. Speaking of the protesters, I think they need to give their big slogan a second look. “Your + Our Grandfathers Called Socialists ‘Pinkos’“. Needlessly wordy, grammatically questionable, and puzzlingly irrelevant. 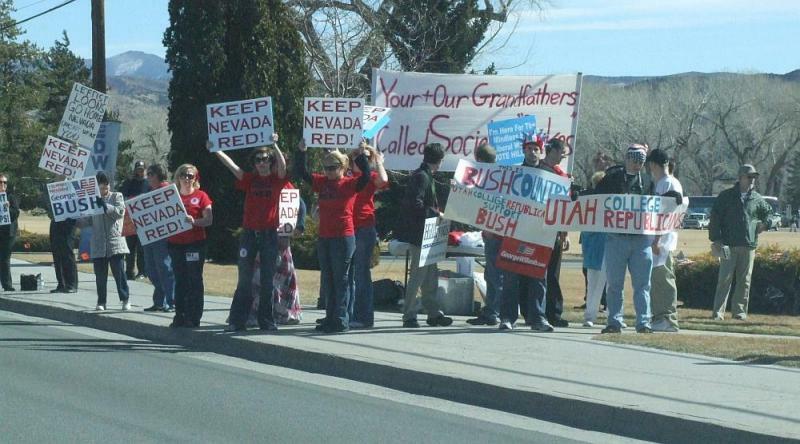 I think their other signs, “Keep Nevada Red” and “Leftist Loons Go Home” were a bit more to the point. I thought “Keep Nevada Red” was a horrible slogan. I get the Red vs. Blue, but that’s awfully funny to be calling on Nevada to stay commie. The election season is getting crazy with so many people running for mayor. Just wait for the judges race! [ http://noelwaters.blogspot.com ] I hope these blog and media, people are there in force, just as they are for these mayor candidates. DEAR ANONYMOUSE? THERE IS “RED” IN THE RED-WHITE-AND BLUE identifying America. ARE YOU SAYING THAT ALL SHADES OF RED ARE “COMMIE”? I hope you come back here to answer that question. Go to art class and learn how to mix shades of color and come back here, for a visit. That was a silly remark. But do visit that http://noelwaters.blogspot.com – We’d love to know what color you’d paint him.